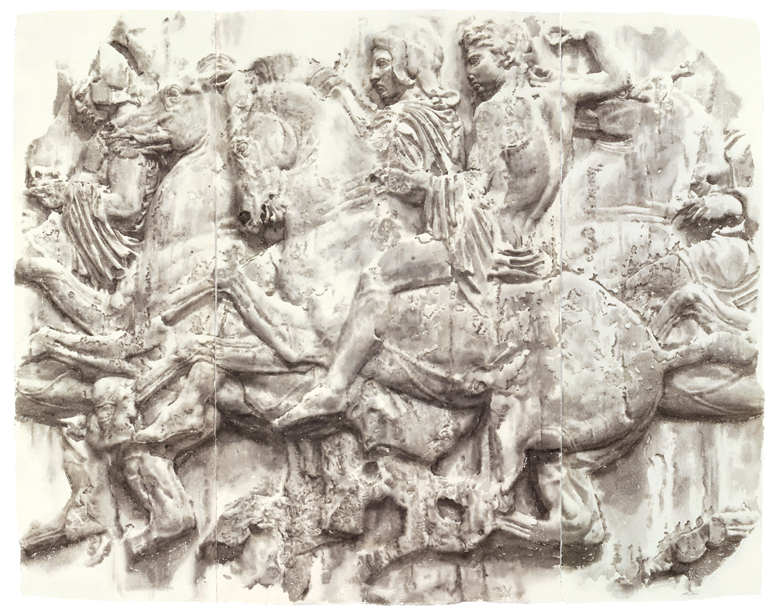 THE PARTHENON FRIEZES. WATERCOLOR PAINTINGS by WENDY ARTIN. At Gurari Collections, 460 Harrison Avenue, Boston, MA. Through January 1, 2012. Interesting art is everywhere these days–heartbreaking art, art that changes the way we look at the world. Concern with beauty, though, is rare. Utter mastery is rare. This exhibition is a breathtaking combination of mastery and beauty. 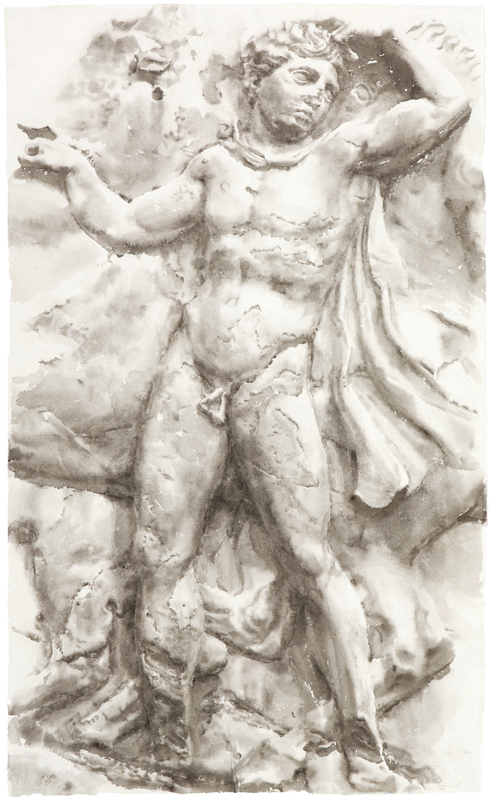 It contains small polychrome still lifes; small sepia nudes; and life-size paintings of the Parthenon Friezes. The whole collection is so good I really shouldn’t say anything except to urge you to see it. But I can’t resist talking a bit about the frieze paintings. 1. Wendy Artin. SACRED BULL. Watercolor. 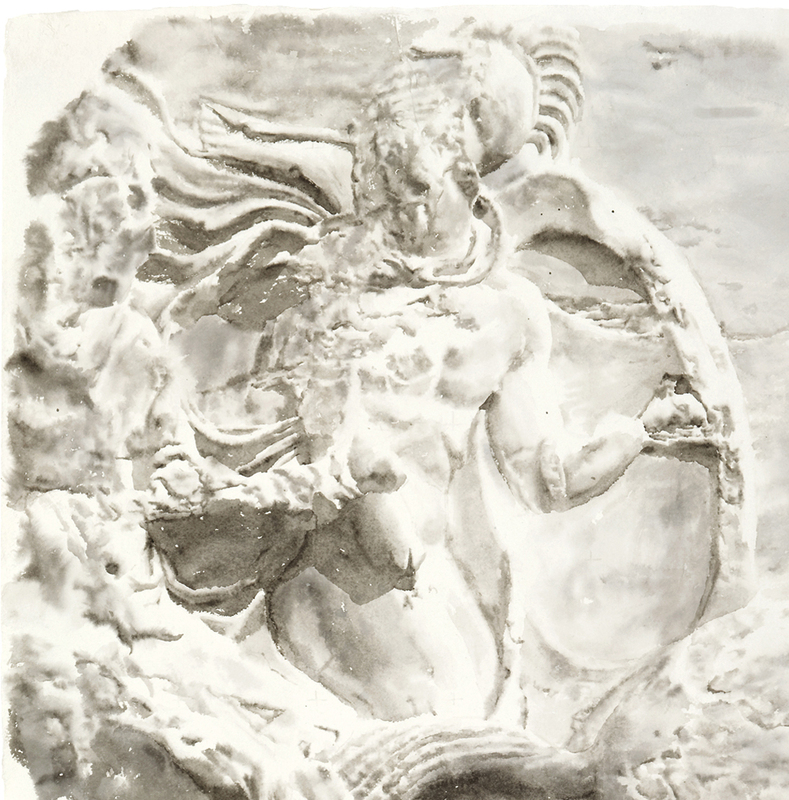 Wendy Artin is a classical painter, figurative, representational, and intensely textured. The watercolors in this exhibition are the product of two years devoted to the Parthenon Friezes now in the British Museum. 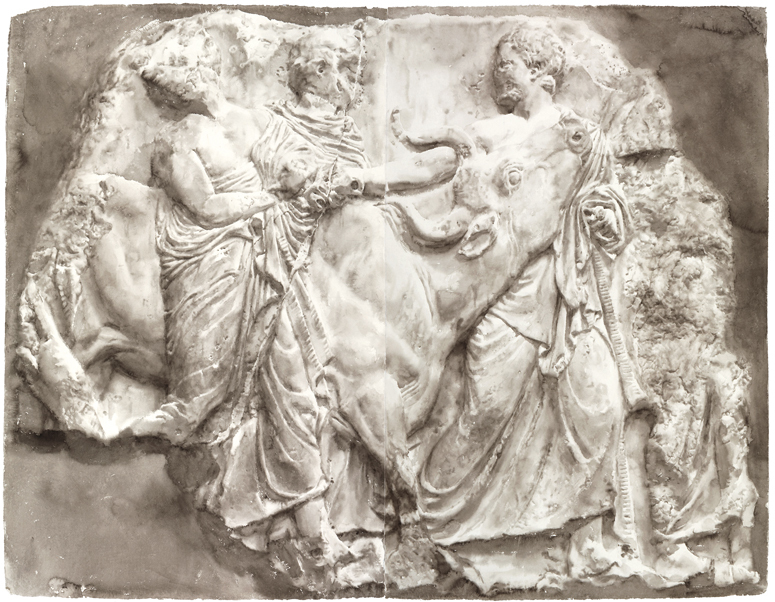 The friezes, showing a sacred Athenian procession, were completed in 438 BC, and attributed to the sculptor Phidias. They originally decorated the top of the inner chamber of the temple; too high to be seen easily, they were also partly hidden by columns. Perhaps this obscurity was fitting, given the holiness of the place and the subject. Artin is not just about representation. Her paintings bring up all sorts of questions about the complexities of beauty. How do we build up beauty from matter? What happens to beauty over time? Does an object lose its beauty when time wears away at it? 2. Wendy Artin. PHRYGIAN CAP. Watercolor. 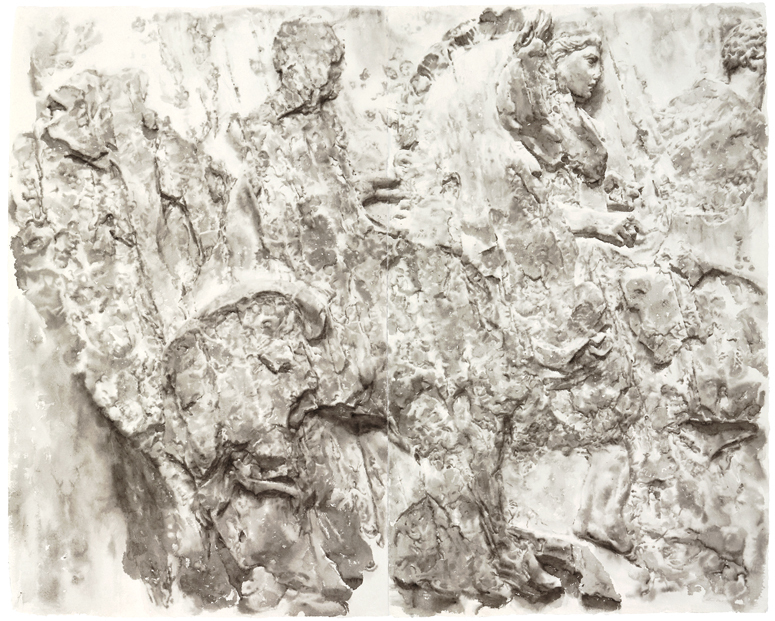 The men and horses emerging from the rough marble background in Artin’s paintings beckon to us. Trying to see them better, we approach. Then as we lean even closer, that uncanny moment happens: we suddenly see the painting not as a large stone bas relief, but as brushstrokes and pools of dried pigment adhering to the rough nubbled surface of the paper. This uncanny hinge occurs with all art, or all art that we can get close enough to, but in Artin’s work the representational mastery is so superb that it seems to happen more often than usual. We sway forward, wanting a more intimate look at the ancient horsemen and their ancient mounts, and then we lose them. Shifting back and forth through these levels of perception is like the visual oscillation of optical illusions, and brings us back to the mystery of painting: how brushstrokes not only evoke but seem to become the things they are striving to represent. I do mean to assign a sense of purpose to the strokes themselves. It feels as though they have will. The interplay between perceived image and puddles of dried pigment also recalls that jockeying between resolution and enlargement that we find in photographs or my old field of photomicrographs. The more we enlarge the negative, the closer we get to seeing not the desired image, but the silver particles of the photographic emulsion. Here, in these watercolors, it is as though we are looking at the elementary particles of art. 3. Wendy Artin. CRAGGY FACE. Watercolor. Like the long-gowned entranced medium in the Victorian parlor who acts courier for messages between the worlds of the living and the dead, the artist’s medium also sits between worlds – internal and external. This sort of medium is a hunk of matter, stone waiting to be hewn, or pigments and paper waiting to be combined. This medium acts as the ground for construction where the private thoughts and visions of the artist are translated into concrete physical forms that can be seen by others. Artin is doing a further translation, here, transforming carved stone into the visual language of paper and pigment, showing us this strange conversion from mineral to vegetable, crystalline to fluid–an uncannily tactile achievement. Marble is the durable stuff. Yet time has shown us the vulnerability of that marble, even if the scale of that time is millennial. As for paper, any madman could rip these works on paper to shreds in minutes. The paper Artin uses for most of these works is the strong and beautiful Indian Khadi paper, handmade from long-fibered cotton rag. For the moment the papers of her paintings are intact, and show to us the ruined stones. I am reminded of the old conversation between Scissors, Paper, and Stone, so old that it is a children’s game, where paper wraps stone, stone smashes scissors, scissors cut paper. 4. Wendy Artin. APOBATE WITH SHIELD (detail). Watercolor. Artin tells me she was consciously avoiding doing multiple washes, because a single wash often misses some places, leaving behind little air bubbles. These can help the paintings to breathe, by introducing tiny bits of light into the darker areas. If you go over a quick wash even one more time, you lose these illuminations. 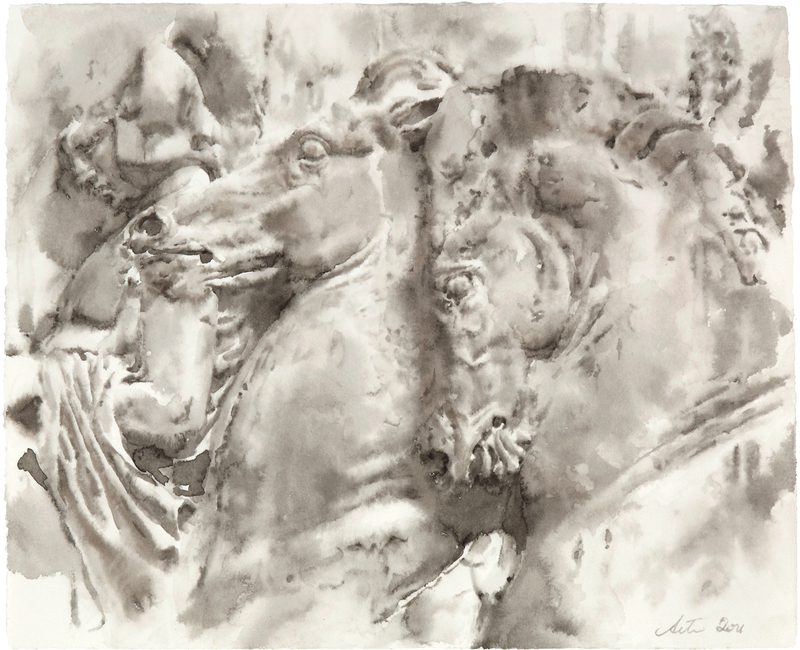 By omitting any underlying line drawing, by flooding the paper with the wash and removing the St. Petersburg Ivory Black pigment in some places, working it deeply into the fibers of the paper surface in others, Artin captures the way the light is reflected by stones, and as she does so the sculpted marble horses and their men come to life. You can see her at work in an excellent documentary film. 5. Wendy Artin. TORSO SOLO. Watercolor. Why do we find ruins so beautiful? Is it nostalgia for a vanished age sweeter than the present? Do ruins give us a pleasurable sadness, a frisson of mortality without the terror? Do they inspire us to a bit of willful dabbling in the shallows of gloom, without the full oppression of despair? Or do ruins remind us of the beauty of impermanence and the pathos of things? 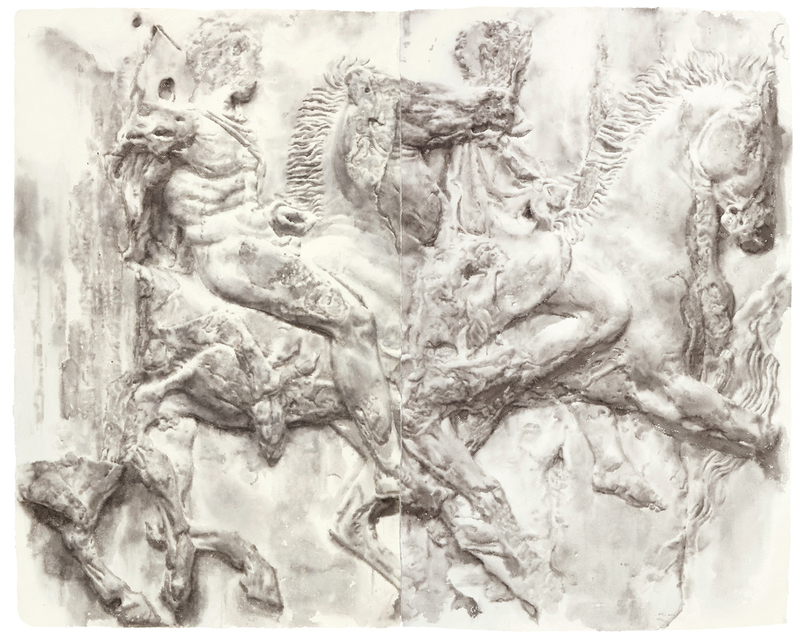 Would the real Parthenon friezes please us as much if they were intact, or does the work of time and the elements add to our fascination with them? We find certain ruined buildings or statues romantic, but when our roof springs a leak it is a disaster. Perhaps we like being reminded of decay as long as it is far enough away that we don’t become afraid. Is our pleasure in ruins at all related to the pleasure we take in the tragedies of drama and fiction where we so “identify” with the hero or heroine that all our emotions are awakened, all our adrenaline and other neurotransmitters, but still, at some subconscious level we keep our distance, knowing that we are on the real side of the fictional chasm. Despite our racing pulse, we are safe. Roller coasters work like this on us, with a much narrower spectrum of emotions and chemistry. The odd thing is that a ruined statue can still be beautiful, so too a fictional character in tragic dissolution. But in a close friend or family member, dissolutions brought about by age may not charm us, and with physical ruin we say the person “had been” a great beauty. In fact we recoil if the physical degradation or decay is too great. 6. Wendy Artin. MANES. Watercolor. Artin paints the presence of absence. That is, she paints every gouge of time and water, every dappled break. Sometimes we see a congregation of horses’ legs, but the back and riders are gone. Sometimes just a mane is left, a horse’s head, a rider’s knee. When we look at the real friezes, in the museum, we tend to skip over the missing parts, where it is just stone and the carving no longer exists. These eroded parts become background, and I think we bracket it, in the sense of gazing around it, in order to see the marvelous carved parts that are still present. But when Artin devotes as much of her gaze to the ruined parts, then we are lured into looking. We cannot disregard them, because she is showing us their presence and their importance. By bringing the absence into the presence Artin is reminding and instructing us to consider what is missing. As she extends her gaze to them, so must we. And how beautifully she paints the various textures of the stone that has been worked not by man, but by the elements. 7. Wendy Artin. PORTRAIT WITH TWO HORSES. Watercolor. Why would one undertake such a project? I think it’s not solely for the final product, that gorgeous translation of marble onto paper. Rather it has to do with patience and looking and paying fierce attention. In making these paintings Artin looked at the friezes for two years. She may know their contours better than anyone alive. Working this way, without pencil, entrains the endurance of the gaze. Painting can lead to the deepest sort of knowing.